Is chevron still all the rage? Or do you think its on the way out? 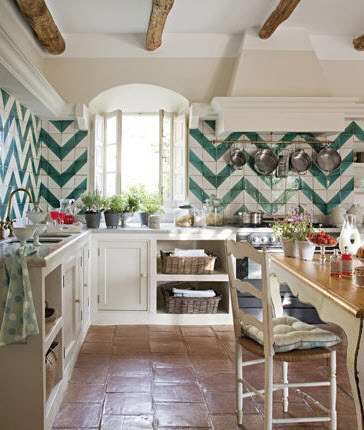 Either way, this kitchen really takes the whole chevron love to a new level. I'm actually kinda digging it. What do you think? I wish I had a country house with a kitchen like this. A country house on a lake, with a boat and a pretty dock to sunbathe on. Yes, that is what I wish. I love chevron I hope it's not on it's way out. I love it too much. I love it but I see it everywhere now (in blogs, I admit, not in real life) so I'm avoiding adding a permanent chevron mark to my home because I think I will get sick of it soon.... and I'm sad about it. Love this kitchen, but I don't think I would use tile...paint would provide the same effect and could be changed easily when I got tired of it. I like it for now but I think putting it in tile is a little permanent. In 10 years, you'll be looking that country kitchen and thinking how awful it looks. Trends in small doses is much easier to live with! I totally dig it! I think chevron still has some life left! I think the chevron print is classic and will never go out of style. :) That kitchen is fab! Oh it's definately still in! And this kitchen? LOVVVE it!! I still like it alright, but I'm definitely getting tired of it. That kitchen is great, though! I will love it longtime ;), but I'm kinda moving in the stripes-on-the-diagonal phase..
Ooh a country house...what a lovely thought for the mid-week! patent leather, chrome, islands, rose windows, country homes and people who have the courage to just do what they love and not give a dang about it being in style. Patricia, I like that attitude! I think it has probably run its course on blogs but I will ALWAYS love it! Definitely LOVE chevron. Unfortunately, I see it on the way out before I get a chance to really utilize it.